You know how grumpy I get when I’ve not had enough sleep? Well, Maxi and Midi took over the entire bed last night and I was too tired to do anything about it. I’m so tired I can see through Time (to misquote my favourite Simpsons quote). So today was a right barrel of laughs, with me and all 3 minxes snarling at each other. Midi was on a mission to drive us all round the bend. She pushed the baby, stood on her big sister, kicked anyone who came near her, threw her toys, refused to eat, whined constantly about being hungry, woke Mini up early this morning with a tantrum, woke her again when she’d only had 15 mins nap with yet another tantrum. Sheesh. As for Maxi, ‘whine’ just does not describe properly how whingey that child has been. As for me, I was so bloody angry with the world in general that I avoided all human company till I got an appropriate caffeine level happening, at approximately 1500hrs. We had a very brief respite over lunch, when I coaxed the brats demons little devils horrors minxes little lights of my life <ahem> to eat their food through downright bribery. On the come-down from such jolliness, Maxi sang the Fifi and the Flower-Tots tune. I choked at her perfect rendition of: “Fifi! And the Flowerducks! Fifi! Forget-me-nuts“. I guess that’s how she interprets Jane Horrocks’ accent. Other bad grumpiness today: I noticed that the beautiful pink Quinny Buzz cosytoes I stupidly shelled out for to go with my shiny new Zapp Xtra (I didn’t need it – I wanted it. Vain old fool) has a stack of unravelling stitching. I’ve emailed pics to Mothercare, but I guess they only have my word for it that it was like that out the packet. We’ll see. More grumpiness: I’ve been deluged with messages (ok, I’ve had 5) from people in Europe and the USA asking if I’d send my eBay stuff to them when it pretty clearly states that I (ok, The Boss) will send to the UK only. I try to explain nicely that it’s because it costs so much money to send a properly-insured and tracked parcel that it’s just not worth their while when they’re buying a baby bottle, or something. So I get ticked off when I get messages demanding: “Spain. Postage?????????????? ?” And one young lady from the USA who asked how much postage would be. And how much would that be in US Dollars. And how much would that be on the day of the sale? (I’m incredibly talented, but I’m NOT PSYCHIC!! And bloody learn to type ‘currency converter’ into Google, you airhead). I’m shortly to feature in an article by a nice freelance journalist in a ladies’ magazine. I suppose it’s effectively a review of some products and exercises, and will feature some gruesome ‘before’ and better ‘after’ pics. I agreed to do it because (a) why the hell not, it sounded like a laugh, (b) there would be a little fee, and (c) a photographer would come to make me look great for the ‘after’ pics. Did I tell you how vain I am? But I also know it would take more than a single photographer to make me look great. Anyway, I wrote loads of notes for the article and will be interested to see how much is my text, but that’s ok – I’m a compulsive writer anyway, and the little fee will be fine recompense. I got a cheeky email from the magazine asking me to do my own photos, so I did, as best I could. It was a terrible experience, but hey, it was 2 hours out of our long lives. Today I got an email back asking, can you do the photos again? Except like this, and like that, and wearing this and that, and can we have them by Monday? After taking my fingers off the p-i-s-s-o-f-f-y-o-u-c-h-e-e-k-y-n-u-t-j-o-b keys, I wrote a long email back explaining why I wouldn’t comply. I figured I was possibly writing to a daft wee girl fresh from school who has no idea of the sheer trauma I went through. She wrote it like I could just stand up from the keyboard, pop upstairs and take 7 or 8 perfect shots. Just in case, I went into detail to re-educate her into the life of a normal woman. Oh yeah, and as well as write the article they want me to take all the photos for it? And give up a whole day’s time when I’d normally be knitting to sell items to pay the bills? And they’re going to pay me how little again…?! I suppose what’s going to happen now is that the lass at the magazine will get her mate to pose for some shots, they’ll use my words and I’ll not get a sausage. Hmmm, I suspect The Wrath of The Trout will be unleashed. Yep, that’s all I need to say. Spent a pleasant rainy afternoon tasking The Boss to gut out the minging hole of a car while I photographed and listed baby feeding bits and pieces and got them listed on eBay, and cleaned up some old toys ready for listing in a day or 2. It’s the perfect antidote when you’re drowning in a sea of plastic tat – give it 10 days on eBay at 1p, and if no-one buys then you feel completely justified in dumping it at the recycling centre. Mini squeaked with delight at being allowed to play with some old toys (new to her) and showed off her super-speedy crawl (4 moves to the second. I counted). Maxi and Midi regressed a few years and enjoyed playing with old favourites. The leftover chicken pie from yesterday gotten eaten up after all. I’m so glad! I didn’t mean to take its rejection personally, but there you go – I’m shallow like that. Before I forget, some Midi-isms. There’s something about your babies learning to speak properly that shocks you (or me, anyway). Maxi learning to say ‘hot cross buns’ instead of ‘hot pum-uns’ booted me into keeping a daily journal. Today Midi said ‘elephants’ instead of ‘epaulettes’. Thank goodness my wee 3 year old still says ‘am-blietz’ and ‘ali-itz’ instead of ambulance and aliens. I nipped up to kiss the minxes goodnight after The Boss got them to bed. I expected to find 2 sleepy or snoring girls. Ha! They were sat cross-legged on their rug, under a shared snuggle (fleecy blanket), giggling secretively to each other. The Boss had given them milk in lidded beakers (obviously pandering to their regression, then!) and they were guzzling their ‘milk shakes’ down. As to why they were sitting on their rug, “It’s so we don’t get our beds wet, Mummy!” explained a wide-eyed Maxi. Obviously. Silly me. Maxi and Midi were already tired when they got home from nursery. I probably should have read the warning signs. Instead I persisted in my little fantasy that we could have some Quality Yummy Mummy (yuck) & Giddy Kiddy (c) time. Fool. My plan was to bake some chicken pies for dinner, partly to use up the mountain of cooked chicken my mother in law left in the fridge, and partly to squeeze in some easy fun time with the girls. I had visions of all 3 sat at the table rolling and cutting short crust pastry while I happily stirred up some white sauce, chicken and peas for the filling. The reality: Mini Minx filled her nappy then was too hungry to play, and Maxi Minx wanted to watch CBeebies instead. “I gon hep oo cook!” asserted Midi, wiping a thick rope of green snot away with her fingers, then testing the consistency between thumb and forefinger. Right. You can keep your little petri dish of a self at the other end of My Kitchen, little girl! So I fed Mini some breadsticks and plonked her in her Kitchen Safe Area (playpen travel cot) while I got on with the sauce. Maxi decided she wanted to roll pastry after all, so started fighting with Midi over who got to use the pink rolling-pin. Mini filled her nappy again. Took the sauce off the heat to clean up. Asked Maxi to help Midi wash her face and hands. Gave Mini another breadstick and stirred out some lumps from the sauce. Hysteria from the bathroom and screaming from both eldest 2. Took sauce off the heat again, raced upstairs. “She splashed me!” “She hit me on a head! Like dat (slap)!” “I can’t see past her stupid fat head to see if the tap’s hot or cold!” “Dat my soap! Waaaaaah!” Yelled and scolded, heard Mini start to wail, ran back downstairs. Dug manky breadstick out from under Mini’s chin. Sauce back on the heat, got out the whisk for the new lumps. Fed Mini a last breadstick, wiped her nose, more lumps appeared in the sauce. Midi came in and pulled the flour out the cupboard onto the floor. It rises into the air like a mushroom cloud. Sauce off the heat yet again, more yelling, more lumps in the sauce. Decide to make pastry in the food processor and give the little devils a piece each to play with. Abandon sauce (now one big lump) and start all over again. And anothe thing: the recipe was duff – how could it ever take 15 mins to cook raw pastry at 200degC? It was still only slightly brown after 30 mins. I gave all 3 minxes a banana each to curb the hunger pangs. It’s now 45 mins past their normal dinner time and I’m way past my final warning. I hit the wine to combat the whines. Just a little half glass to take the edge off the Whinge Volume. It makes things worse because I stop caring that we’re all miserable. Finally dinner is ready. It smells delicious. The recipe book promises it will be beloved and praised by all. Here’s hoping it just gets eaten. Mini throws her pastry to the cat and thumbs a pea up her nose. Midi eats a bit then starts to snore. Maxi takes one sniff and wails that she hates chicken, and anyway, she wanted a pie with a cut-out pastry cow decoration, not the sheep, so can’t POSSIBLY eat this. I start clock-watching, willing it to hit 1850hrs. I’ve been in denial a long time, but no longer – my wee baby is a whole year old today. Well, at 14:49hrs exactly. You can see for yourself in the pic below. This time last year I was measuring my waistline one last time (46″) and messing around with The Boss nervously in his scrubs. I was going to write a long post all about Mini’s birth, but you know what, who cares? 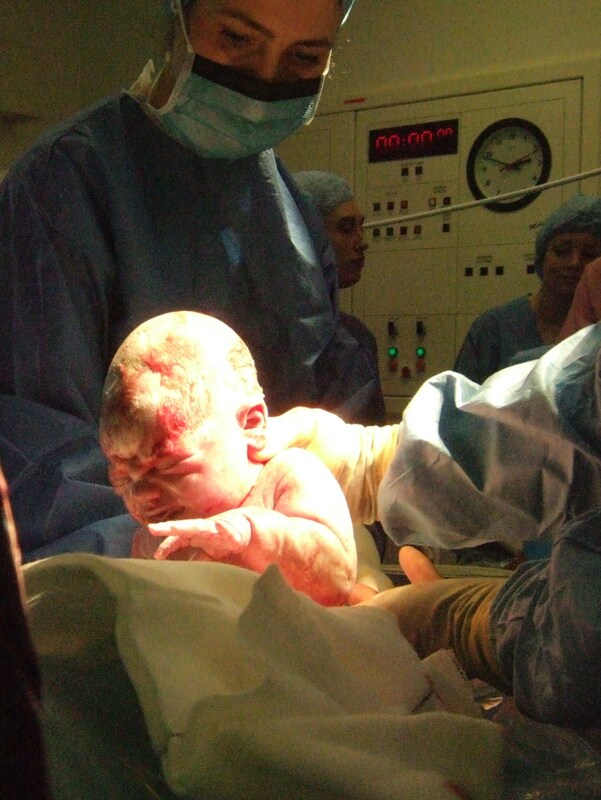 She got here safely, I was delighted to be allowed to watch her being born (no drapes!) and she’s been the giggly, yummy centre of our family for 12 months, now. I’m going to spend this evening compiling a big album of photos from Mini’s first year, to proudly sit beside the well-thumbed and well-loved ones of her sisters. Well, of COURSE I'm going to wear a rainbow wrap, amn't I?! The weather perked up a bit right after opening my 40th birthday presents, and as the wrap was a pressie from me to me Mini Minx in anticipation of a little fee for a magazine article, it would have been churlish not to get outdoors and try it out. (photo deleted) What surprised me most is that Mini actually let me put the wrap over her head when she fell asleep – normally this is a huge no-no. So, I guess woven wraps are getting a big tick from us. Now to try back carries…! Wish me luck. Sure am: I’m now 40. I toyed with the idea of “you’re not 40 until you celebrate it” and ignoring it completely. But to be honest, I’m not that bothered about being 40, or being old. Got too many other more important things on my mind! So I decided to celebrate my big birthday on Sunday just past, by celebrating my baby’s 1st birthday. Originally I’d been a bit put-out at the expectation that me and Mini Miinx would share a birthday to suit my in-laws who flew up on Saturday and departed on Wednesday, Mini’s actual first birthday. But it made logical sense, as The Boss would be at work on Wednesday. And I wasn’t bothered at all about whether my birthday was commemorated or not. After a lot of analysing why I felt so bloody grumpy about it, I came to 2 conclusions: I don’t like HAVING to do anything, and I didn’t want Mini’s most special of birthdays to be over-shadowed at all. But the most significant thing that’s happened in my 40 years on Earth has been the 3 minxes, so what better way to note those 40 years than to concentrate on one of those girls? I’ll blog about Mini’s birthday separately; this post is all about Me Me Me. I opened my presents in the morning and spent all day feeling quite overwhelmed with phonecalls and messages from friends, and the outpouring of love from my family. The Boss isn’t a man of words, but he wrote a lovely message in his card that reduced me to tears (not telling – it’s private. It’s not rude or deeply personal, it’s just a message from him to me). Thanks to Facebook’s handy note of the day’s birthdays, my brothers didn’t forget for once, and sent me messages that made me smile through my grumpiness. I spoke to my Dad on the phone at night, round about the actual time I was born. He’d had a skinful because he was staying at his little brother’s, and they were having a great time together. Alcohol makes my Dad more overtly emotional and he exclaimed how sad he was that we lived so far away, and how much he wanted to put his arms round me and give me a cuddle. I made some noises about “I know, but we’ll see each other soon, it’s ok”. Actually, what I wanted to say was, “Me too, Daddy! I really, really miss you and hate that I haven’t seen you in a year. I’d absolutely kill for a big Daddy Hug just now!” But of course I didn’t say that, did I? Because that would have made him feel worse. What also made me even grumpier was the fact that I don’t remember my Mum’s 40th birthday party at all. I’d have been 17 and still living at home, full of hormones and angst and parental-hatred and utterly, utterly self-centred. I’ve not cried over my Mum in a long while, but this past week I’ve really missed her. It’ll be the 3rd anniversary since she died on 29th March. I have some videos of her with Maxi Minx, just before she had a big stroke at the start of her first bout of chemotherapy, and just before we lost her as ‘Mum’ (her body lived on for just over a year afterwards, but with a different personality inhabiting it). I just can’t bring myself to watch them. I can look at her photos, and frequently do as our walls are covered in photos of our families. But to hear her voice or watch her move again would hurt more than I can bear. I’d kill for a cuddle from my Dad, so maybe you can imagine what I’d sacrifice to have one more hug from my Mum. Saturday 19th March wasn’t a great day for me – I was a tad ill. Again. After giving my immune system a shoeing last weekend with gastroenteritis, I was a pushover for some sore throat-y, sore chesty, wheezy, ouchy, knackered-making virus all week. Saturday was the worst day. I sprayed with chloroseptic stuff and it made a difference for 5 seconds. Even munching chocolate made no odds to the razor-blade-in-the-throat feeling. So you can imagine my expression when The Boss sprung on me that I was being surprised witha birthday lunch in Contrast, Inverness. With 20 mins notice. And no clean nice clothes. I guess in hindsight my tirade was quite funny. I had to whisper (no voice), probably frothed a bit (couldn’t swallow), and was generally quite incoherent (I couldn’t understand why he was subjecting me to this when I felt so awful). When we arrived and I admitted how terrible I felt, my mother in law got very upset and wailed, “I always manage to do it wrong, don’t I?” I had 2 options: agree and berate her son for dragging me out, or croak that really it would be fine and I probably would feel better for getting out the house. Yep, I went for option 2. And actually, it ended up being the truth. I couldn’t taste the food, so couldn’t comment on how nice it was, but the big cold glass of wine mixed with half a cupboard of painkillers swilling around in my stomach certainly made me feel quite jolly and happy. I certainly couldn’t feel my sore throat. I must remember this remedy for next time. (photo deleted) When we got home, my in-laws gave the girls the first of their presents – the most cool pirate dress-up outfits I’ve seen. I think they may have come from Sainsbury’s? As by this time they were starting to play up a bit, me and The Boss between us cooked up a cunning plot to get them to eat some normal food and get to bed: make a quick snack dinner of cheese sandwiches cut in the shape of coins (round scone cutter), beaker of watered down apple juice, some fruit pieces and some little chocolates (well, your mother only turns 40 once…). We hid them in their room under a stack of paper crosses (“X marks the spot”). Maxi and Midi Minx enjoyed their little treasure hunt and wolfed down their pirate treasure. They were snoring within the half-hour. Result! My mother in law is on a diet. Again. I think she is like the majority of women (it seems to me) in that she is always on some diet or other. Usually from the pages of a quality (ahem) paper like the Daily Fail. This one involves eating nothing but protein at first, then it ‘allows’ you to eat some fruit and vegetables. It forbids carbohydrates of any kind. My father in law is joining her in a limited way to show moral support for her bid to lose weight before her 60th birthday, which I think is very kind of him. Me, I’m just mystified by diets in general. I just don’t see the point. Surely if you feel you are too fat or too heavy (they are not necessarily one and the same thing) you just eat less and move more? Why go through some fancy footery combination of what you can and cannot eat? To my mind it’s a simple equation of calories in has to equal calories out or you’ll get fatter. If you are, you have to ensure your calories out are greater than your calories in, by expending more energy (exercise) and eating less. Newsflash: THERE IS NO MAGIC BULLET! You cannot suddenly get slimmer by eating x% of your protein before silly o’clock in the morning, or if you always eat ‘z’ magic product with your morning snack, or if you stop eating one specific food group altogether. You’re only going to get slimmer if you eat less and work more. There’s no hidden secret to it. Maybe I’m grumpy because any diet that restricts the fruit and vegetables you can eat makes me super-cynical (call me old-fashioned…). Maybe I’m grumpy because I think that Special Diets that dictate that you can only eat x, y and z very expensive things are just making money out of gullible people, made vulnerable by their vanity and/or greed. And before you think I’m having a poke at fat people, let me tell you that I am a greedy, lazy woman who eats everything, and enjoys chocolate and cake whenever the wish hits me. I am a UK size 14 because of my cake-and-quite-little-exercise habit and I don’t give a damn about it. I’m happy to trade a fashionable figure against some short-term good feelings in my mouth and my tummy. Do you think I might be being grumpy because I unreasonably expect everyone else to be Captain Logic about diets, like me? Perhaps. I’ll need to mull on that some more. In the meantime, I wish my mother in law luck in her quest to slim down. She’s looking well on it, and weight loss will make her happy. I just hope her insides don’t suffer too much from the lack of essential vitamins and minerals. Well, after the 2 ‘Trading Standards’ posts here and here, I went to do my food shop at Tesco with some trepidation. I know it was a different Tesco, but still – I have a very, very distinctive surname, and they might compare notes. (And God help me when I inevitably apply for a school-friendly shelf-stacking job there, after grassing them up to Trading Standards). I only had 20 mins to do my standard 60 min shop, so poor Mini Minx had to do without our customary singing love-in* and be whizzed around the aisles. * I cannot stand shopping, for anything. It’s not that I hate to part with money, no. I just get so indecisive, and by the time I decide on a purchase I’ve gotten bored or fidgety and want to move on. And being stuck in huge supermarkets makes me feel trapped. So I bent over nose-to-nose with Mini Minx (or whichever daughter is in the chariot driving seat) and exchange back and forth coos. We chat, sing songs, blow kisses, rub noses, rub chins, generally have some fun. And as I drift down the aisle I grab what I need almost as an afterthought. Sure beats doing proper shopping! You know how much I hate shopping trolleys? Well, it was the same old story today – of the 5 left that Mini could fit into, 3 were broken, one was covered in seagull poo and the other was wonky. I say wonky. What I mean is it wouldn’t go in a straight line. At all. More a drunken parabola. Except I didn’t notice for the first 2 aisles because I was in such a rush to be finished and pick up Maxi and Midi on time that I don’t think the (backwards and squinty) wheels touched the floor. I cursed and hauled and curved my way to a check-out. I suppose one advantage of hateful trolleys is that they sure cut your shopping down to grabbing the absolute essentials only in order to be finished with this torture! An efficient check-out assistant started scanning and packing my stuff in my own bags for me as I threw my shopping on the conveyor. Perhaps she saw me kick one of the wheels. Perhaps I said aloud my murderous thoughts about the trolley. I don’t know. She suddenly asked if the trolley was ok. “No. Wonky. Ouchy back.” I pouted. She waggled a finger at the gofer lady (supervisor? I don’t know – the 12 year old in the wireless headset and baseball cap who flits from check-out to check-out) and asked for another trolley to be brought immediately. I protested that it was no bother, I was nearly done. “Oh no dear, think of your poor back!” she insisted. A shiny trolley was whisked to my side, my packed shopping moved over for me, the remainder packed and stacked for me as I moved Mini over. What a service! What an on-the-ball, observant, kind-hearted lady! I swear I skipped to the car with a lighter heart. I might even have whistled. Q. What do you call a donkey with 3 legs?